Hello my friends. It has been a pretty gloomy day here in Wisconsin. Frigid cold, and more frigid cold! I feel like a polar bear. The winters here seem to get so much longer every year. Well with that said I thought I would try to add a lighter feel to my home. I felt the need (for insanity purposes) to bring a touch of spring inside to help with the winter blahs. 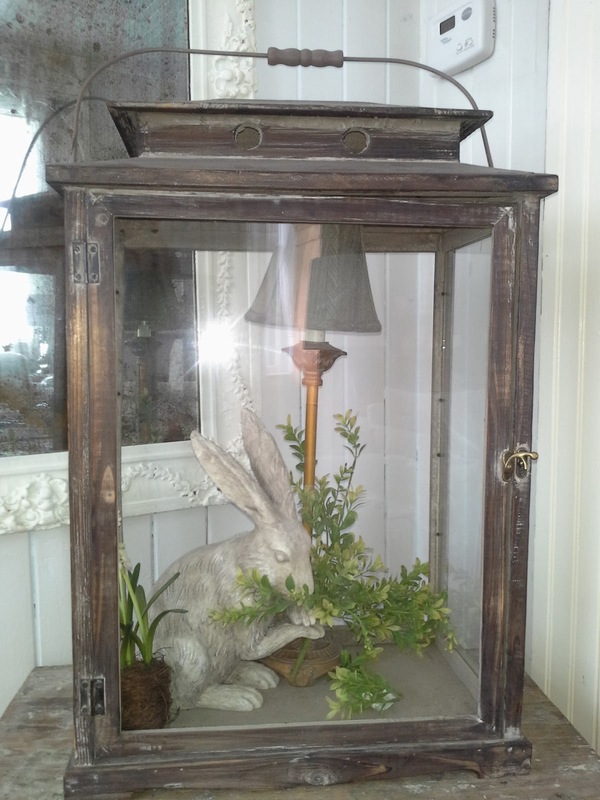 I had managed to bring out a few of my favorite bunnies to add to the vignette on the coffee table. As you probably already know, I love blues and whites together even the pastel blues. Now I feel the need to paint something. I have not figured out what yet but when I do I will be sure to post about it. What do you all do to brighten your home in winter? Love your touches of Spring. I can't wait for Spring to get here. I love the bright airiness of your living area! The flowers in the window are perfect, I think that's what I need to do too. This is absolutely beautiful. I would never know you are in Wisconsin! Your living room is beautiful! Glad to have found your blog over at Marty's. Saw your feature over at Marty's and ran right over! I love every inch of this room! Would love for you to stop over to see my living room. No Spring touches YET, but soon:) Love how you have styled the cloches and the lantern! If you turn off word verifiaction, you will get more comments: alot of bloggers now won't comment if they ahve to do this. Just to let you know. Just saw you featured over at Marty's...so glad I did! Love love love everything about this space! So pretty! Saw your gorgeous living room featured at A Stroll Thru Life and had to come check it out - so glad I did! Love your colours, furniture and accessories - such a pleasing combination. I like that the room still has a cozy winter feel but the spring touches you added hint of what's to come - HOPEFULLY! A Stroll Thru Life featured you... and I saw the picture of your pretty room and had to come by and see more! Your room is really lovely. Very inviting. Love the bunny rabbits, too! Found you on A Stroll Thru Life & I'm a first time visitor ...now a follower. I think your room is just perfect & I look forward to browsing your blog. So happy to land here! I don't remember visiting your blog before. Everything looks so pretty! My daughter lives in Madison for the past year but is getting ready to move back to Illinois in Springfield. She hates the winters there and can't take another one. I too don't like winter this long in Quincy, IL and have put away the winter decor and got out the spring decor too. Yours looks beautiful. Loving your spring inspiration as we're bracing for another snow storm!! Coming over from A Joyful Cottage. Love your room. Your beadboard walls are awesome. I'm a new follower.